There is a reason that I like to keep my living room tidy. When I, or my wife or daughter come home and decide to relax, we go to the living room. It’s a place where we gather, unwind, watch a movie, read a book or just sit and do absolutely nothing. When it’s tidy, there is a calmness that comes over me and I feel like all’s right with the world. I know it sounds weird, but I think it’s mentally, physically and emotionally healthy to keep your living room tidy. 1. Furniture That Serves Two Functions – My beautiful wife turned me on to this. We have a living room table and a footstool that also double as storage units. 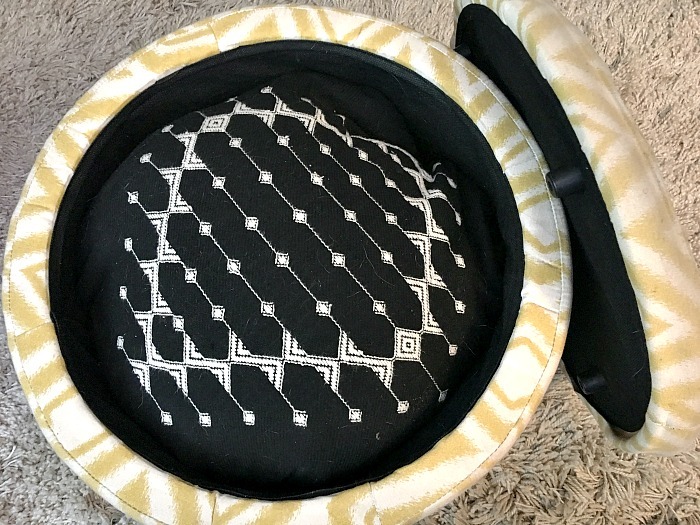 They house seasonal pillows, blankets and other knick-knacks, but they also look great and are a HUGE space saver. 2. Clean Up a Little Everyday – BIG, BIG, BIG!!!! This is the one thing that I always have to remind myself of… if you have an extra 10 minutes, do some cleaning. Dust, wipe down the TV screen, reorganize the game consoles (HUGE thing in my house) or just fluff some pillows and make the couch look good. 3. Hide Your TV Cables – You want to talk about an eyesore?! A bunch of cables coming out of your television will make your living room look horrific. A Legrand flat panel recessed connection kit helps offer convenient access to the back of your TV. You can hide those ugly TV cables with this easy routing of TV power and HDMI cable in-wall, that has zero electrical wiring required. 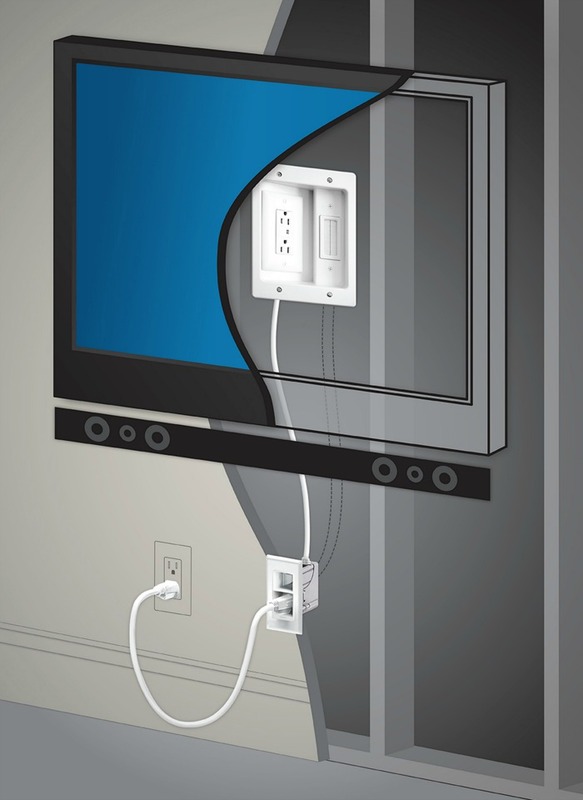 Connect your television to cable and electricity in a completely seamless style with the Legrand flat panel recessed connection kit. Its in-wall storage takes control of all of your cables and wires to eliminate tangles across your floor. Then the white decorator plate provides a finished look. 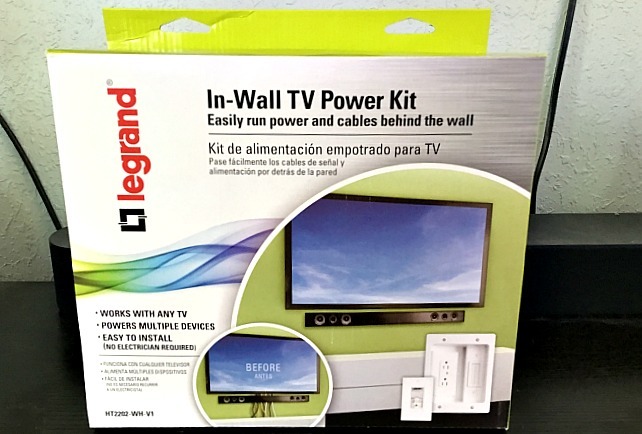 You Can Find the LeGrand In-Wall TV Power Kit at Best Buy! In my house, I am Mr. Christmas. It is officially my FAVORITE time of the year! I go crazy with decorations, I start working on my Holiday menu and generally dive head first into all things holly and jolly. But, I might have a tendency to overdo it. 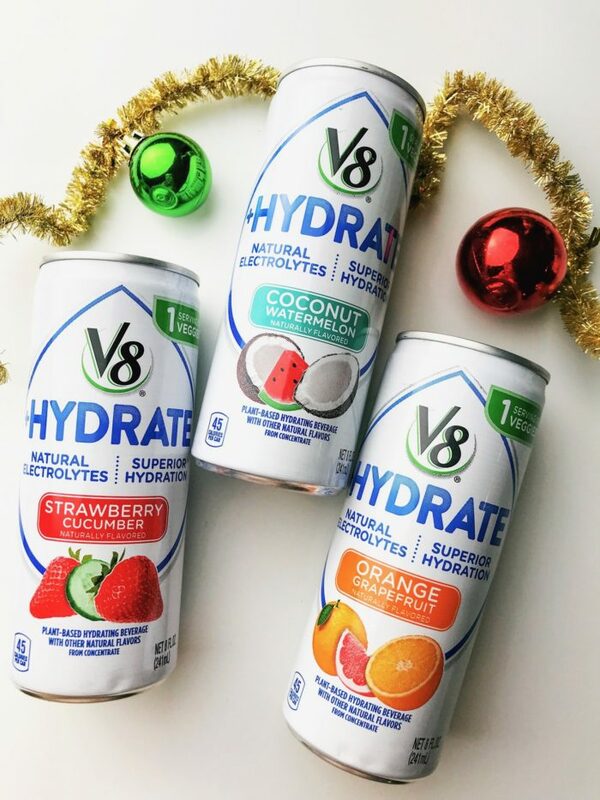 This year I’ve decided to conquer Holiday hustle and bustle with new V8 +HYDRATE. We all know that it’s super easy to get stressed out this time of year. Whether I’m frizzled, frazzled or straight up spent… I can’t slow down until January 1st rolls around. 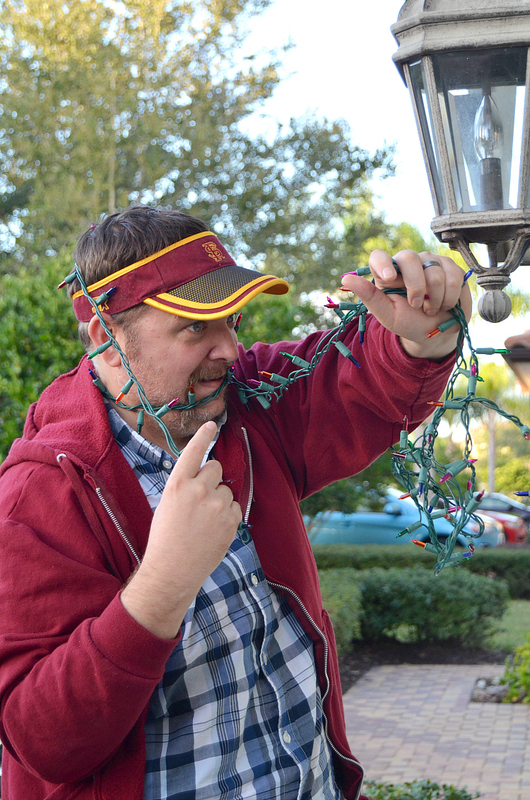 First, I start with the decorating. It lays the groundwork for putting me in a holly jolly mood. Yes, I’m the guy who puts up his tree before Thanksgiving (Don’t Judge!! ).Then, I start in on the cooking. I do everything from scratch and most of the recipes are very ingredient and labor intensive. My family knows that in the final weeks leading up to December 25th, you’re more than likely going to find me in my kitchen. Finally, I have all of our family over for a Christmas Eve party. We bake and decorate cookies, exchange gifts and have really great time being with each other. I’m tired just writing about it! This year I’m going to be stocking up on something that I think is going to take care of me this season. 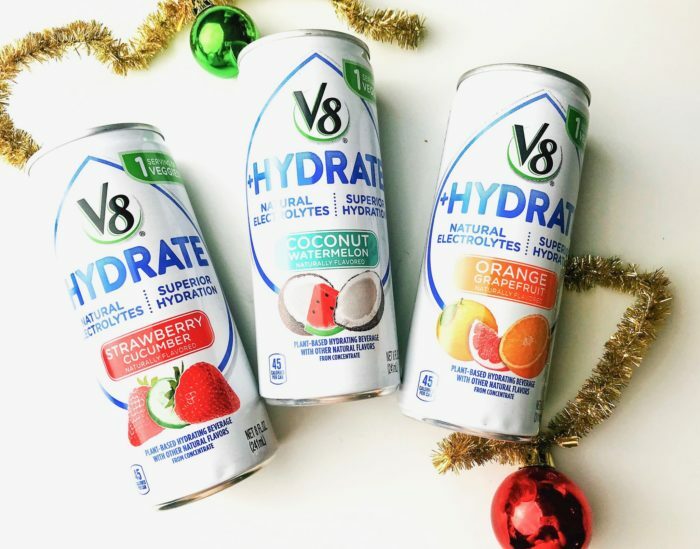 V8 +HYDRATE is a tasty mix of natural electrolytes from vegetables and hints of fruit that can help you restore your holiday cheer. V8 +Hydrate will give superior hydration with its isotonic blend of natural electrolytes that come from sweet potatoes and it has hints of fruit for a delicious beverage that will replenish you quickly. There are 3 tasty flavors to choose from. Orange Grapefruit, Coconut Watermelon and Strawberry Cucumber. 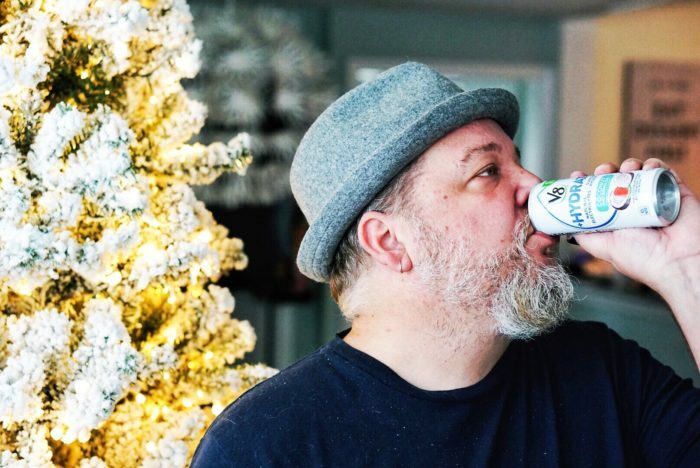 If you’re looking for something this season and beyond, that will keep you feeling hydrated and on top of your busy lifestyle. 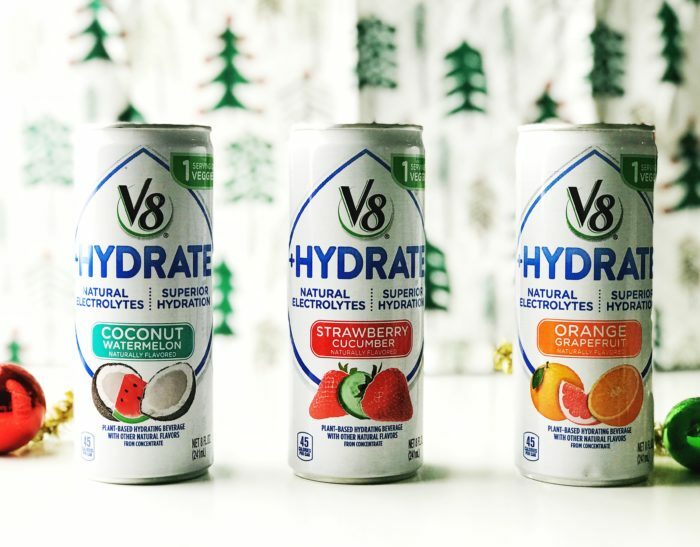 Give V8 +HYDRATE a try!! I’ll be the first one to admit that I am a hard person to buy gifts for. It’s not that I have high expectations, actually the complete opposite. I have a great life and really have everything that I could want or need. 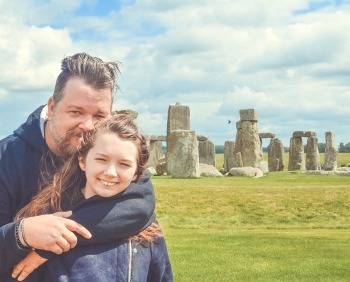 My wife and daughter are constantly frustrated with the gift giving process when it involves me! 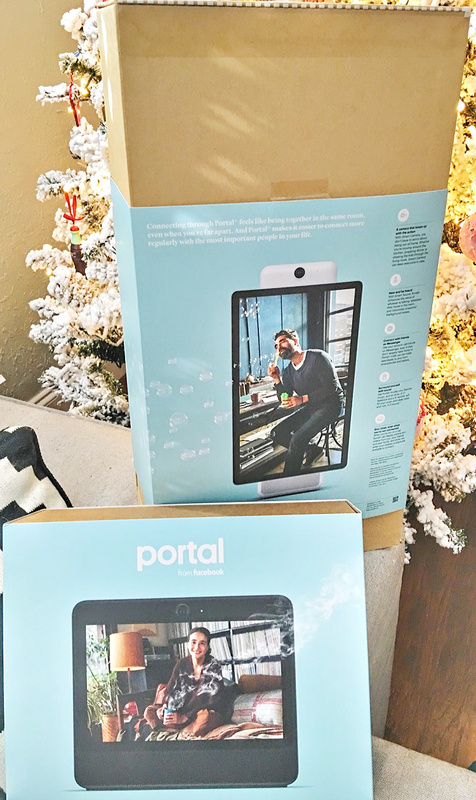 This holiday season I received my first BabbleBoxx and realized that maybe I had not been thinking outside of the Boxx (Pun TOTALLY intended!). The gifts that were included are fantastic and will have the guy in your life covered from top to bottom… Literally! 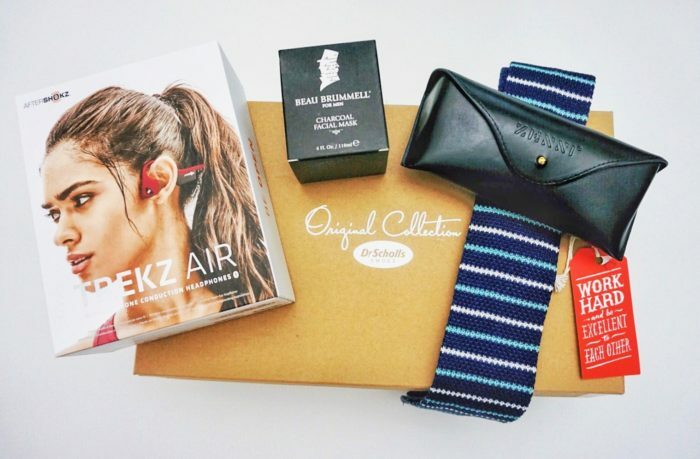 I got products from Ties.com, Zenni, AfterShokz, Dr. Scholl’s, and Beau Brummell. This is a treasure box of gifts for every man who is wanting to look cool, feel good and bring a little style back into their life. I didn’t even know that Dr. Scholl’s made shoes. 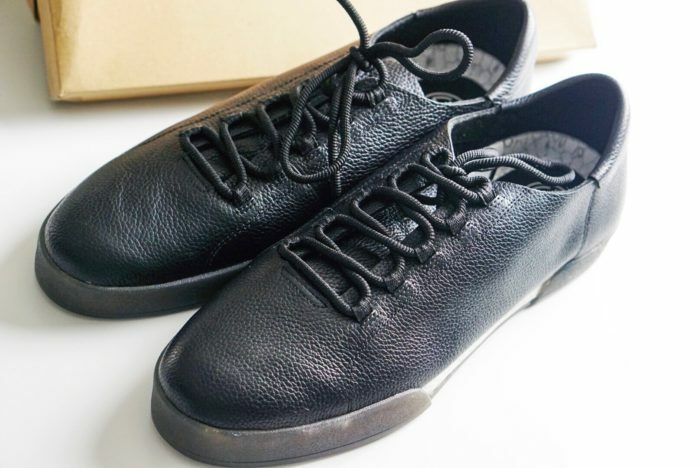 I’m glad I know now… The Dr. Scholl’s NIKOLA shoes are incredible! They’re super comfy and go with everything. I love me some facial products! My wife and daughter got me doing masks a few years ago and now they’re part of my grooming routine. 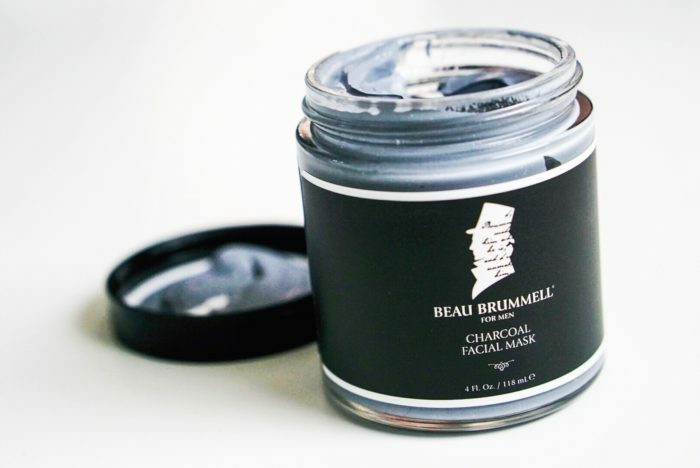 The Beau Brummel Charcoal Facial Mask left my skin feeling refreshed and clean. Big thumbs up on this product! Use coupon code ‘BEAU15BRUMMELL’ for 15% off your total purchase at beaubrummellformen.com Offer valid through January 31st, 2019 at 11:59 pm EST. I travel a lot and I can’t even begin to tell you how many pairs of headphones I’ve burned through. AfterShokz are designed with comfort in mind. They have a great design and the sound quality is crystal clear. 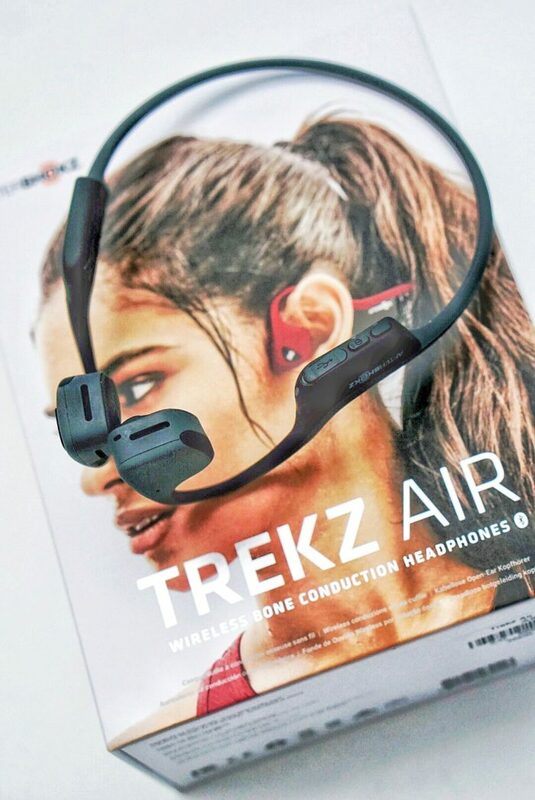 one free sample of Trekz Titanium Slate Gray to gift. I’m not a big “tie guy”. I blame 12 years of private school! But, my wife loves the way I look in them. I was impressed with the tie.com selection that I got. 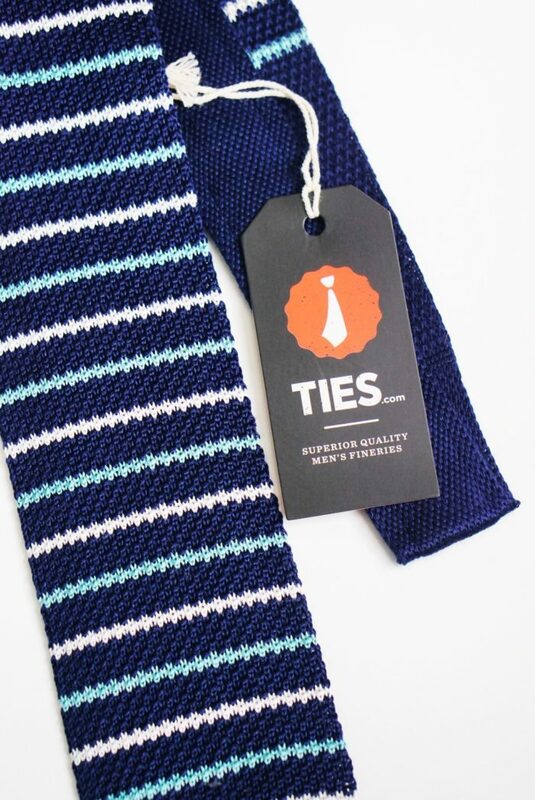 The Navy Blue Swiss Stripe Knit Tie had a great retro look that I thought was pretty stylish. Use code TIESXBB for 15% off from now until 12/31/18. I started wearing glasses about 5 years ago and one of the first things I discovered was that they are EXPENSIVE! 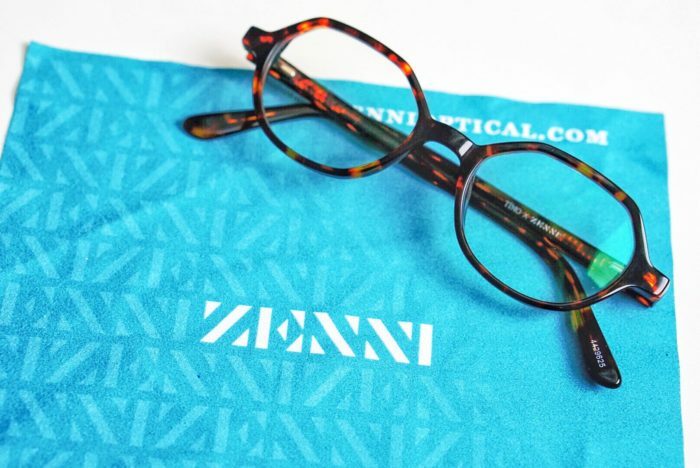 I was super excited about the Zenni glasses because they are not only stylish, but really affordable. I’m going to be getting a few new pairs, including some prescription sunglasses. If you want a gift guide for guys, any one of these gifts would be great this holiday season, but all five together is just brilliant. The guys in your life will be blown away by BabbleBoxx. My wife and I have a problem when it comes to decorating. Every 2 years we want to change/update a room in the house. Right now, we’re looking to update and redesign the kitchen. 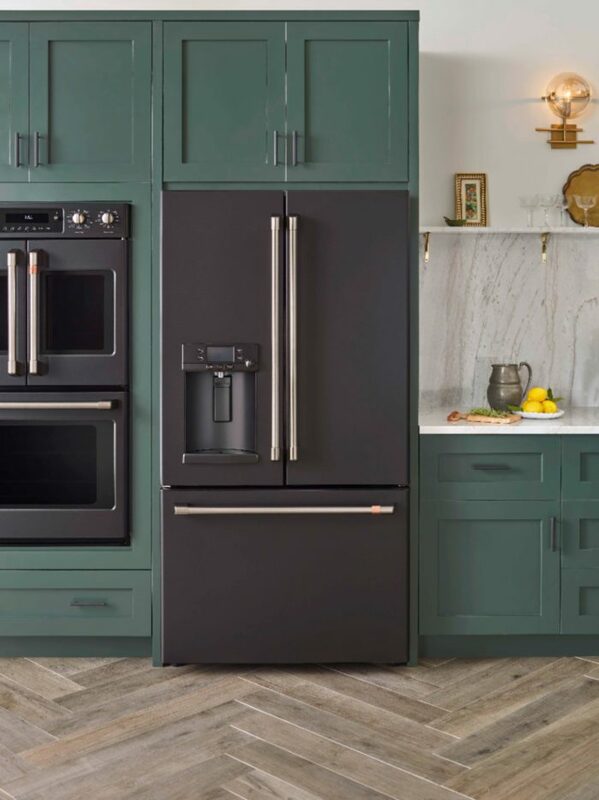 I am REALLY particular about the kitchen, because I spend a lot of time in there and the Cafe Matte Collection by GE looks to be a perfect way to design my dream kitchen. The GE Cafe Matte Collection is a new collection of modern kitchen appliances. They allow you to customize exactly how you want! 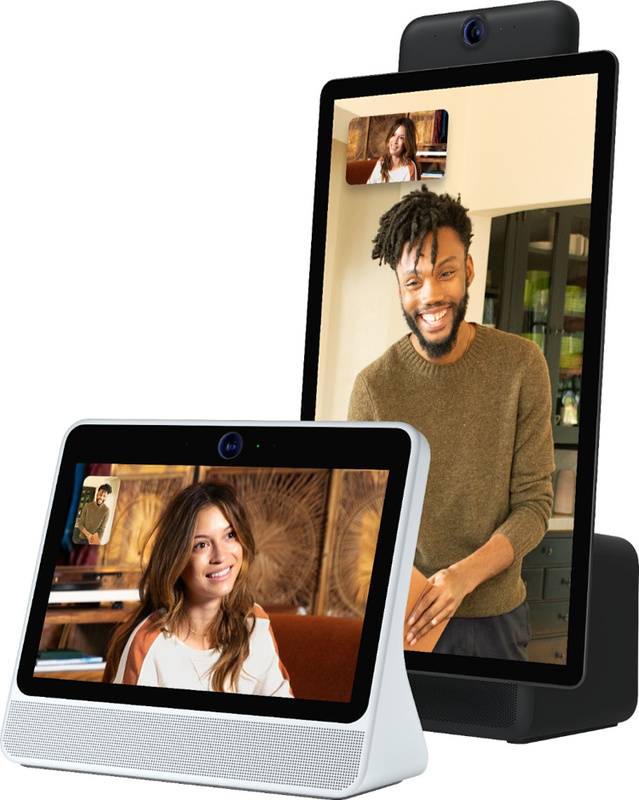 There is a Modern Matte Black or elevated Matte White finish that will set the canvas and a distinct line of customizable hardware options that will help complete the look that reflects your personal style. 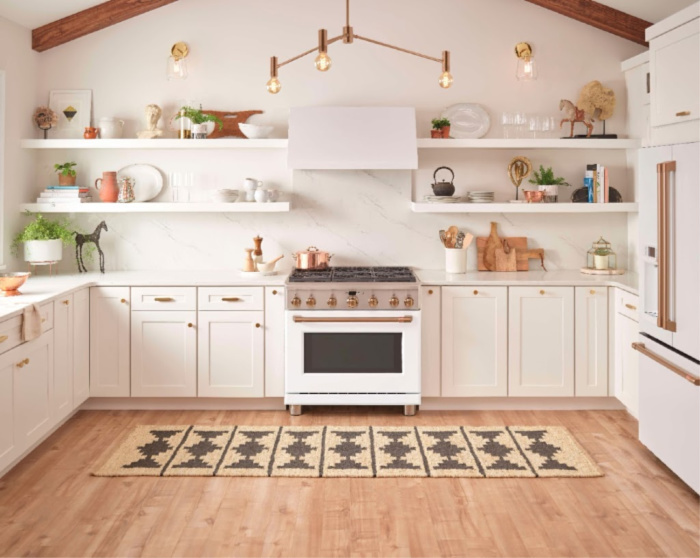 Instead of letting appliances dictate what your kitchen is going to look like… It’s time the appliances had a personality. Yours! This is a collection that is all about personalization and high-performance features that spark creativity. With the Cafe brand, you can select brushed bronze, brushed stainless or brushed black hardware choices to customize either one of the matte finishes. These little touches will help you compliment your overall kitchen design. My wife and I have already found that the Cafe Matte Collection by GE is sparking some major creativity in us. The Matte White and Matte Black premium finishes will seamlessly complement our choice of premium cabinetry and flooring. It’s helping us create warmth, depth and personality in our dream kitchen.